Mobile commerce apps are exploding in the app market. Every business has started creating its mobile shopping app. The reason is that people are using their mobiles more than other devices for shopping and getting many of the tasks done. Mobiles are always with people, and they can get the job done anywhere and anytime. Those companies who started with an e-commerce website are quickly creating a web app too. They don’t want to lose their customers. A site cannot match the convenience that mobile apps offer. Personalization and a high level of customization are possible with mobile apps. 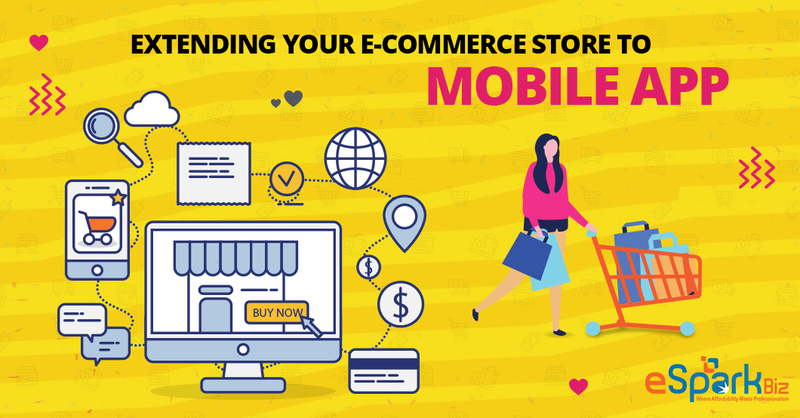 Let us see how extending an e-commerce store into a mobile commerce store helps. The statistics of mobile users and the exponential increase in the use of m-commerce is enough reason to extend your e-commerce website to a mobile app. According to Statista, the m-commerce worldwide will touch 700 billion USD in 2019. The same statistics also say that 50% of all online sales will be through mobile apps. There is no wonder that every company is rushing to build their mobile m-commerce apps. Websites cannot match the ease of use of mobile apps. In every way, mobile apps make shopping much more comfortable and more trouble-free. Whether it is the selection of the items you want to buy or the payment methods, everything is so easy on an app. The main advantage of a mobile app is that it allows users to do their tasks even when they are on the move. They can complete their shopping while commuting from office. Customers don’t have to spend extra time doing their shopping. It is the kind of convenience that people expect nowadays. For retailers, mobile apps enable better engagement with customers. People are reported to be spending maximum time on their mobiles to do shopping. It means that there is a better chance of customers browsing through your m-commerce shop and making a purchase. Another plus for the retailers is that having a mobile app increases the chances of search engines ranking their websites higher. Mobile apps are an excellent way to search engine optimization. The search engines now consider mobile app contents along with web contents for grading the site. Mobile users usually download an app only if they are inclined to purchase from you. It means that if your app is on the smartphone, there are more chances of the customers buying from you. But when they visit a mobile website, they are not sure whether they want to purchase anything. Once the user downloads the app on the phone, customers will not think of looking elsewhere for their stuff. It is easier to shop from an app that is already on the phone. The app will have users’ details. There is no need for users to feed anything. They can make purchases within a short time. You can use the details in the mobile app to further market to your users. You can introduce various loyalty programs to keep the customers using your app. You can allow your partner retailers to advertise in the app, making you revenue and getting customers to purchase more. Other features of mobile phones also add to your advantages. The GPS in mobile phones can help locate your physical shop if the customers wish to visit. You can program the app to inform the customers when they are near your shop. It is easy for customers to click a photo with their new purchase and upload on the app or their social media sites. Cart abandonment is a big problem that most e-commerce sites face. It is due to the slow response of the site and more extended checkout procedures. Mobile apps are much faster in responding to user requests. They offer a much faster checkout procedure. The user doesn’t feel frustrated and leaves halfway through the purchase process. Because of the above facts, there is much better average order value with mobile apps when compared to websites. There is a 140% increase in revenue through mobile apps when compared to mobile sites. The figure for growth is 130% when compared to websites. It is enough reason for companies to start creating mobile apps. Push notification is a feature that a Mobile Application Development Company can incorporate in your mobile app. This feature is advantageous when you want to send some information to the customers. You can announce discounts or loyalty programs using these notifications. You can also remind customers who have not used the app for a long time about using the app. Mobile apps score a lot over websites and mobile sites when it comes to user experience. It is one crucial factor which leads to cart abandonment. When there are so many choices available for online shopping, people don’t want to suffer any inconvenience while shopping. Mobile apps allow for easy sharing on social media sites. It will enable your customers to share their purchases or product choices with their friends effortlessly. It will help in your getting better publicity. More people will download your app. All businessmen what to improve their business. Mobile apps come with great analytics which will help you know your market and customers in a better way. You can create better content on the app and have a better response from your customers. More and more people use mobile apps, and the figures are going up every day. Ease of usage is the main advantage with a mobile app. Customers can shop anywhere even when they are traveling. This convenience saves a lot of their time. Better customer engagement for the retailer as people spend most of their free time on mobiles. The main activity on mobiles is searching for apps or using some of them. Mobile apps help in SEO and getting a better ranking in the search results page. More chances of purchase from the shop if the user has already downloaded the app on the mobile phone. Users’ details in the app help you market your products well. You can allow your partner retailers to advertise in the app which will make you money. GPS in mobile phones will allow the customer to locate your store easily from the app. The camera in a mobile phone allows customers to click pictures with their new purchases and share with friends. Cart abandonment is much lesser with m-commerce because of a faster checkout process. The average order value on m-commerce shops is 140% more than mobile websites and 130% more than e-commerce websites. Mobile app feature push notification helps you in retaining customers and announcing loyalty programs. Mobile apps give a much better user experience than e-commerce sites. Sharing on social media will help in better publicity for your m-commerce site. Powerful analytics helps you improve your business. It enables you to create excellent content for your mobile app. You must get a good application development company to develop your mobile app so that there are minor bugs at the time of launching. Your mobile will be ready for testing soon. Your mobile will be sharing the data already available in the e-commerce database. It means that only the presentation is going to be different. It is an important step. There are many platforms to build an e-commerce website. There are content management systems for enterprises, like Magento and WooCommerce. You can make a good e-commerce site on any of these. You have to create your mobile app from any of these e-commerce sites. Identifying the right platform is key to the success of your mobile app. That crucial step will decide the future of your business. Each of these platforms has its pluses and minuses. The application developer must consider these and develop the app. You must remember that your mobile app is an extension of your e-commerce website. Customers are already used to the look and feel of your site. They know the brand logo and colors. You cannot change any of these when you build the mobile app. The mobile app should feel like an extension of the e-commerce website. Customers must be able to identify your brand immediately. It is the only way to get all your existing customers to use your mobile app. There should not be any difference in the overall experience of the m-commerce app. A content management system or CMS helps to create a website. It contains all the necessary elements that you need. One of the systems that make e-commerce website building easy is Magento. There is a seamless exchange of data. When different software elements of the same system use the data, there are no risks. The data is secure from any attacks on an e-commerce website. But it is not like this in a mobile app. The mobile apps and the database do not exist in the same system. The app has to get the data from the database. There are connectors between the two. These are called Application Programming Interface or APIs. These are essential for the app to get data from the database. There can be many APIs already available on the website. These APIs help the mobile app in getting the data from the database. But the app development firms have to create many more APIs for the smooth functioning of the mobile app. The application view and the APIs must have a good integration. Only with this can we have a smooth functioning of the app. The view adds a lot of data about the product. There is a lot of information available on the page. There is also dynamic information on the server. The APIs help to pull this data. There are many data in the server which are not constant. The can keep on changing. The app must get this information from the server each time. Whenever the customers give a request for price, this process happens so that the customers can see the latest price. For the security of the mobile app, a good API integration is necessary. The app functions as a separate component. The server is a separate entity. It is the APIs that helps communication between the two. The connection is only need-based. It is an essential requirement for any product. Before launching the product, you must test it for proper functioning. It is all the more critical for a mobile app because people will hardly come back to the app if it is not satisfactory. With the availability of so many apps, users will not try the app again unless fully satisfied. You must test the app for many parameters. Apart from the automatic testing of components, the app is also subject to manual testing. The app is used under various conditions to ensure that the running is smooth. The testers use the app and see if there are any bugs. The developers will correct everything after the testing. You must launch the mobile app after complete testing. The two main stores Google Play store and Apple App store insist on fulfilling a lot of conditions. You should ensure that your app adheres to all these conditions while launching the app. You can advertise the launch of the app in various forums. You can use your website to promote the app. Other good places to advertise the app are social media sites. It will ensure that many people download your app within a short period. There are many platforms available for building the mobile app. Choosing the right one is essential for the success of the app. The mobile app should look and feel like the e-commerce website to maintain your brand image. The mobile app should give the users the same experience as the website so that you get all your existing customers to download the app. Though there are readymade APIs, the developer has to develop some APIs for the smooth exchange of data between the website and the mobile app. Proper integration of the APIs will ensure that the data which the user sees is updated continuously. A good API integration will also help in the security of the data and the app. You must test the app thoroughly before launching so that the users have a good experience with the app. You must fulfill all the conditions laid by the app stores before you launch the app. After you launch the app, you can advertise the same on your website and social media sites. There are certain features which are necessary for the app to function. These are not additional features, but the necessities to give your users a good experience. You must incorporate these features in the first version of the app. Log In / Registration – It is essential for the user to register. Then they can log in every time they want to make a purchase. This kind of authorization happens through the client-server API. Settings – There should be settings which the user must be able to change. Push Notification – This is available on all the major mobile platforms. This feature is very useful for you to communicate with the customer. Categories / Products – There must be products which fall under different categories. Each of these has a specific ID in the database. All details like price, name, and description are attached to each product. Payment Options – You must include different kinds of payment methods. There must be a facility to pay using credit cards, debit cards, e-wallets, and PayPal. In many countries, cash-on-delivery is also very common. Tracking Purchase – Users must be able to track the status of their order. It will help them when they receive the goods. Shopping Cart – This is essential for customers to accumulate the products they have selected. They must be able to add and delete items from the cart. Customer Support – This is essential for an m-commerce app. Customers must be able to contact the support team or receive a call back when they need. Whether to go for a native app or hybrid app depends purely on how much you want to spend on the app and how much time you have. We can see the plus and minuses of both apps. The app integrates well with the device allowing easy use of all the device features. Native apps perform better in apps which require to process a lot of data. M-commerce apps need to process a lot of data and refresh very quickly. Gestures work better with a native app. Users can swipe, pinch or double-tap with a native app. You must develop native apps separately for each of the mobile platforms. It means more time and money. Developers can create a hybrid app much faster than a native app. It is also cheaper to build a hybrid app because you don’t need a separate app for each platform. The hybrid apps may not be able to use the device features like camera, calendar, etc. The performance is slower than that of a native app. We have seen how important it is for an e-commerce website to have an extension on the mobile device. More people are now shopping through mobile apps. The convenience offered by mobile apps is unparalleled. Sites are not as easy as mobiles to operate. Moreover, mobile apps provide the comfort of being able to use anywhere. You must get one of the Top Mobile App Developers to get the job done. Your mobile app is an extension of your e-commerce website. So, they should offer a smooth transition from the site to the mobile app. You must keep the brand image intact. Customers should be able to shop in one device and checkout in the other. Many e-commerce companies have benefitted hugely by building an m-commerce app. But it all depends on how smooth and fast the app is. The main advantage of using mobile apps is speed and convenience. Your app must certainly offer these qualities. Next articleOtter + Pop case for iPhone now available for purchase (finally)!